Elektor is now selling MightyOhm Geiger Counter kits in the EU! 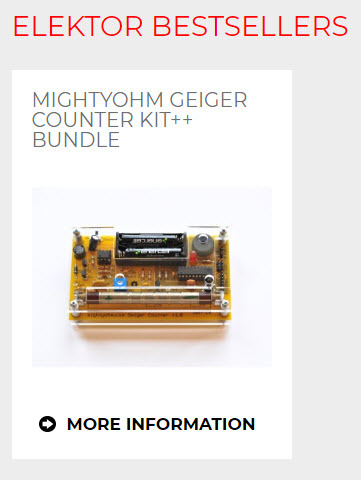 Elektor, publisher of the well-known European electronics magazine, is now selling the MightyOhm Geiger Counter kit in their webstore. good kit! arrived about 10 days after ordering from Elektor. took an evening to build. unit can be tested before installing tube by touching a jumper wire across the tube clips. HV measures about 150V with an ordinary voltmeter. good enough to know HV is present – don’t try to set it this way. can judge and adjust tube clips by using a tool of similar width as tube connector – bend clip gradually for ‘mild’ grip. when installing tube, put pressure on the tube connector itself to push it into the clip. probably a good idea to install the bottom part of the shield/case before installing the tube.